I used to struggle with why we have the stories we do in Genesis – about the sons of Jacob destroying the city of Shechem, or Reuben sleeping with his father’s servant girl. My expectation was that the Bible was a book of simple moral stories to teach me how to live. Actually, the point of Genesis isn’t that at all. It’s to trace God’s blessing throughout the family of Abraham, and understand who’s chosen to carry it on to the next generation. Next time you read Genesis, pay attention to a key question lurking in every plot twist – who will receive God’s blessing? Of Abraham’s sons, Isaac received it rather than Ishmael. Of Isaac’s sons, Jacob received it rather than Esau. It was God’s choice each time, and it was usually the less likely person that he chose. Many stories are told about the twelve sons of Jacob, because each was the father of one of the twelve tribes of Israel. Which of them will receive God’s blessing and carry it to the world? You’d think it might be Reuben, the very firstborn, but he dishonored his father by sleeping with Bilhah, so he was disqualified (Gen 35:22, Gen. 49:3). Simeon and Levi are next in line, but they were both disqualified because they destroyed the city of Shechem (Gen. 34:25, Gen. 49:5-7). That’s actually why Genesis includes both of these ugly stories. At the end of Jacob’s life he prophesies about the distant future of each of his son’s families, and he reminds Reuben, Simeon and Levi of their past sins as he withholds his greatest blessings from them (Genesis 49). Jacob had his own idea of who should be heir, and he chose Joseph, the first born son of the wife that he loved. That was the source of jealousy and conflict in the family. 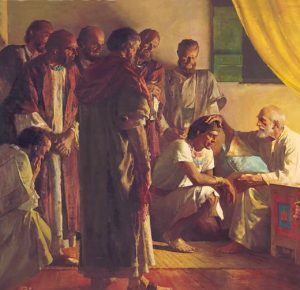 It was why Jacob gave Joseph the special coat, and why Joseph’s dreams that his family would bow down to him infuriated his brothers. When Jacob was old he gave Joseph the inheritance of the first-born — a double portion of the estate. He did this by adopting Joseph’s two sons, Ephraim and Manassah as sons of his own, so that they would become two of the tribes of Israel. Looking ahead into the future, it’s interesting to see which tribe God ultimately chose to carry on the greatest blessing. Will God concur with Jacob’s choice? God used Joseph to save his family, so he blessed him in one sense. And the tribes of Ephraim and Manasseh became prominent among the ten northern tribes. The name “Ephraim” was often used later to refer to all of northern Israel, because it was so dominant and prosperous. But actually, the ultimate blessing went to Judah, the fourth-born son of Leah, the unloved wife, who became the instrument of God’s redemptive plan. He was the one who would ultimately give rise to Christ. Jacob prophesied it when he said, “The scepter will not depart from Judah, nor the ruler’s staff from between his feet, until he comes to whom it belongs, and the obedience of the nations is his.” (Genesis 49:10) This was fulfilled when Jesus, the Lion of the tribe of Judah, arrived on earth! Thank you for all your articles, they bless all who read them and take them to heart. This article was very interesting, when I read Genesis about a month back I never thought that the whole book was about who God was going to bless. Reading this is makes sense it is a book filled with stories about God blessing people and who he was going to bless. When I first read the book of Genesis I likes it because it had many textbook sunday school stories like the Noah, Adam and Eve. I thought that the book of Genesis was to glorify God and to share his story of creation. This article makes me look at it different and I can see that there is another meaning to Genesis. Who is going to receive God’s blessing? Up until a few months ago I found it hard to get into the old testament mostly because its the same old stories I have been hearing since I was little and everything else used to just seem like rules to me. The way God put into his word so many stories that fit together and keep linking up has blown me away in the past little bit has been awesome. In this case though why did God use Judah to fulfill his promise? What is the significance of Judah? Also these stories of the brothers doing wrong you say those are in there to point to were the promise is and is not headed in Genesis but is there other significance to? I found this to be a very interesting way of thinking. Probably the actual correct way. I’ve always liked Genesis specifically because it is full of stories. I find it more of an interesting read and a bit more engaging. I always thought about the stories of more as a back story to the Bible. Giving us some background information so we understand better. In reality, it is, but it is also more than that. It is showing God’s line of people and who He chose and how He chose them. God had a reason for everything He was doing and the Bible clearly lays that out for us.